Wildspread contamination of water sources in Viet Nam's major cities has reached alarming levels, putting residents' health at risk, but recent discoveries of potable water offer some hope, Ha Nguyen reports. Too often, Tran Thi Ty, 48, in Ha Noi's Hai Ba Trung District, has to bring water to the National Institute of Hygiene and Epidemiology (NIHE) to have it tested since she fears being infected by arsenic. "I often take water samples from the tap to have these tested twice or thrice a year because apart from underground water pollution that authorities have been warning about for years, the ongoing construction activity around my home has been increasing, causing water pipes to break and water being polluted," Ty told Viet Nam News. 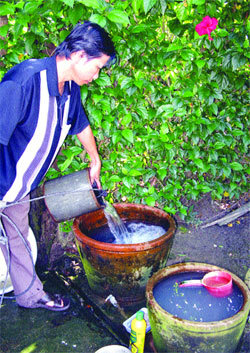 Little choice: A farmer in Phu Yen Province uses unfiltered polluted water from his own well. — VNS Photo The Lap. She said although getting the water tested was prohibitively expensive, costing VND7.3 to 10 million, depending on what kind of tests one wants to get done, she had little option. "Thanks to my being diligent about it, our six-member family, including my elderly parents, could escape from ailments such as cancer caused by polluted potable water. Many of my neighbours were not so fortunate as some of their relatives either died or fell victim to serious diseases such as diarrhoea," Ty said, adding that the cost of tests, while being expensive, is still too cheap compared to hospital fees. Asked what kind of water her family drinks, Ty said she has to buy mineral water to drink and keeps a machine to filter water for cooking. "However, I am still confused whether we are safe or not," she said. It's not urban people like Ty who face the problem of polluted drinking water; inhabitants in most rural areas of Ha Noi's also face the same situation. 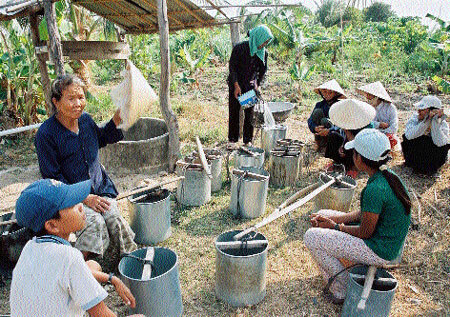 Duong Van Le, director of the Ha Noi Centre for Potable Water and Rural Sanitation (HCPWRS), said the centre received water samples from rural areas' water supply stations and households' tanks to be analysed twice a year. Results show that several newly-built water supply stations, though arsenic and chloroform free, have permanganate and ammonium (NH4) in quantities above acceptable norms, according to Le. Do Quy Hung, deputy head of the centre, said many households were not aware of the importance of safe water and still used water from their own wells or from rain water tanks out of old habit. Many of them were poor and consequently did not want to spend money to lay a pipeline from the water meter to their home. They also did not want to pay the monthly water fee. Water rations: Farmers in the central province of Binh Thuan's Tuy Phong District wait their turn to get water from a well. — VNS Photo Xuan Truong. Bach Ngoc Quang, head of the Centre for Water Resources' Basic Investigation of Underground Water Resources Division, said after investigation in cancer hit villages of Dong Lo and Dong Phuong in Ha Noi's Ung Hoa and Chuong My districts, "We have discovered that water resources in these villages have been seriously polluted, causing a larger number of deaths due to cancer or serious ailments, compared to other villages." Other reasons causing water pollution include household wells that have been dug too shallow and are located near sewers or waste water ponds, coupled with unhygienic habits such as throwing waste everywhere. "This could cause locals virtually poisoning themselves," said Quang. Hoang Van Thiem in Nam Dinh's Truc Ninh Village said many of his fellow villagers, including the old and the young, had died of cancer. "I think such deaths could have been caused by polluted water which may contain too much arsenic. Many households in my village are very poor and have no other solution to the problem," said Thiem. Almost all his village households get water for daily use from their own wells that is not tested. He said, however, that he would try to save money and have the water tested from his well this year. Pollution on tap: A resident collects water in Phu Yen Province's Son Hoa District. — VNS Photo The Lap. 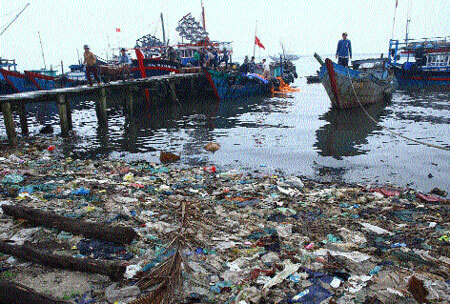 Underground water and surface water pollution has been happening at an alarming rate in Viet Nam, particularly in big cities like Ha Noi and HCM City, as urbanisation process continues on a fast pace and the environment is being seriously downgraded. Research from a project, "Development of urban water network to be adapted with climate change" conducted by Viet Nam's Construction University and the Tokyo University, showed last month that most underground water resources, including the main water supply for domestic use, had been seriously polluted by arsenic, harming their health. 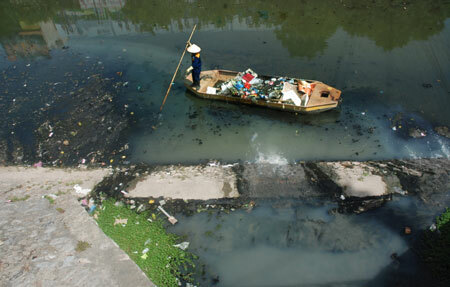 Tran Duc Ha, deputy head of the Construction University's Institute for Research on Water Supply and Drainage and Environment, said Ha Noi water resources were the most heavily polluted among 770 urban resources nationwide which spew waste water into rivers to the tune of 5.2 million cubic metres per day. Compared to this, there are only 24 plants treating such waste water at a total of 550,000 cu.m per day. Results from the project showed that quality of water resources from main rivers such as Hong, Duong and Day was neither ensured nor stable, and this was difficult for the authorities to manage, said Ha. Experts from the Viet Nam Institute for Environmental Science and Development (VESDEC) evaluated that all rivers in Ha Noi had been polluted and "none of them has reached the first level - no pollution or light pollution." To Lich and Kim Nguu rivers in particular have become a matter of great fear for thousands of Hanoians living along their banks. Nguyen Thi Muoi, whose house is located in Cau Giay District's Yen Hoa Ward, said local people had seen the To Lich River becoming heavily polluted for many years. "Several rich households have moved to other places but many residents living along the bank are too poor and continue to suffer bad smell from the river day after day," said Muoi, adding that she never dared to keep her door open. She proposed that authorities should have a plan to solve the problem and rescue people, particularly children and the elderly, from health hazards. These rivers themselves have been under great pressure as a lot of untreated waste water from industrial zones, hospitals, trade villages and waste water from daily use by millions of people is spewed into them. This has led to increasing pollution. Many Hanoians continue to suffer from cardiovascular and lung problems. "If proper solutions are not found, the number of Hanoians suffering from ailments related to polluted water and air will double by 2020," said Le Ke Son from the Ministry of Natural Resources and Environment. The government should have suitable plans to attract local people to join in safe water supply projects and waste water treating plants, said Son. 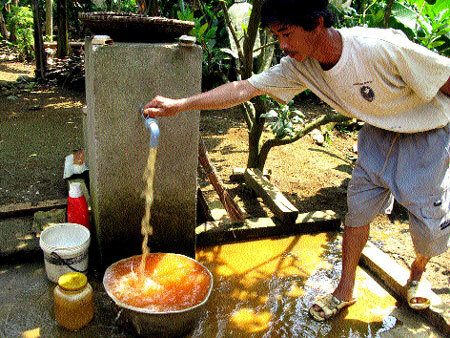 Nguyen Huy Nga, head of the Ministry of Health's Environment Management Department, said many international studies showed that using potable water contaminated with arsenic would adversely affect human health. The standard of 0.05mg/litre for rural drinking water is temporarily acceptable in Viet Nam because water filtering and treating facilities treating are rarely available in rural areas, according to Nga. Countries like the US, Japan, South Korea and Singapore have set 0.01mg/litre as acceptable arsenic content in potable water. In Autralia, the standard is 0.007mg/l. "Viet Nam's underground water resources are seriously polluted, so we need to set suitable standards for each area, " Nga said. As a short-term plan, relevant agencies should promote educational campaigns to increase awareness among local people about how to tap safe water, and also encourage them to use filters for potable water, he said. "There is a need to impose stringent rules to force all households, and businesses to prevent water resources from being polluted and to thus ensure that arsenic in potable water remains under 0.05mg per litre," Son said. The government has approved a master plan to manage drainage water in Ha Noi by 2030 with vision to 2050 as per which the capital should invest VND116.5 billion to build 39 stations in urban centres to treat waste water. These will have a total capacity of 1.8 million cu.m and 2.4 million cu.m by 2030 and 2050, respectively. Tong Ngoc Thanh, head of the Division for Water Resources Planning and Investigation for northern Viet Nam, said the division finished its project of investigating underground water of Neogen layer in Ha Noi area. Results show that south Ha Noi has many areas that are rich in quality potable water that has low iron content and no arsenic. "The project has determined prospective areas having a water potential of more than 1.6 million cu.m perday," said Thanh. "We have also discovered several areas having a great output of water resource at 36oC or warm mineral water that could be tapped for domestic use, garment and electric industries as well as tourism development," he said. New urban centres of Linh Dam, Dinh Cong and Phap Van in Hoang Mai District have tapped this kind of water for domestic use, Thanh said. He, however, said that tapping this kind of water at a depth of between 60-110m, the initial investment could be much higher, compared to that required for tapping underground water.